I’m always caught by surprise when Valentine’s Day rolls around. It’s in part because I get that “oh, shoot… did I make sure to get something for that special someone?” feeling and in part knowing another year has gone by. Days like these are like life markers, acting as little reference points for the passage of time. I can look back and think about what I did this time last year, and so on… And what do I remember? Well it seems I’m on a bit of a cake kick since last year, I made a strawberry layer cake. 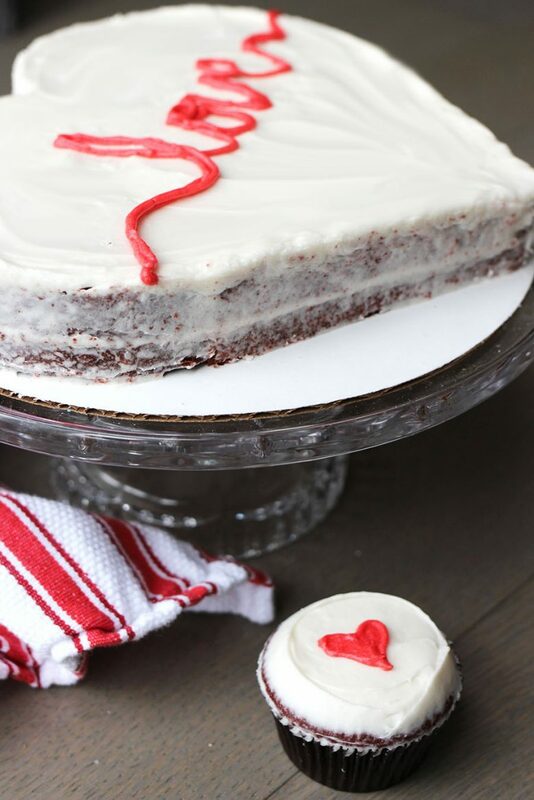 And this year, I’ve baked up a heart-shaped vegan red velvet cake! I absolutely love how this cake turned out! (Did you see what I did there? :P Alright, I’ll stop.) But in all seriousness, vegan cakes are quickly becoming some of my favorite cakes to bake. I started to look into more vegan options after learning about some of my own food intolerances. And I’ve been pleasantly surprised to find that I many times prefer vegan cake over the more traditional counterparts. Vegan cakes offer a moist, rich and flavorful crumb but are also easy on the tummy for those of us with dairy and/or egg sensitivities. It’s definitely a win-win! With Valentine’s day on my mind, I thought a heard-shaped vegan red velvet cake would do the day justice. Red, the color of love; a heart, the shape of love; and cake, the cravings of love. I made up that last part, but for me it’s a truism. With a little bit of creativity and cake ingenuity, it can be pleasantly surprising to see what you can produce with dessert! With just a few deliberate slices, a love-worthy masterpieces was born. Bake this for your loved ones (and don’t mention that it’s vegan!) and I promise it’ll become an easy favorite. It’s an easy and delicious recipe with some serious visual appeal. What’s not to love? I order many specialty ingredients from Thrive Market... give it a try! Preheat oven to 350F. Prepare cake pans and set aside. I lightly sprayed one 6" and one 8" round pan with vegetable oil and lined the bottom with parchment. In a stand mixer with paddle attachment, beat coconut oil and sugar together until light and creamy, about 5 minutes. Meanwhile, whisk together flour, cocoa powder, baking soda, and salt in a separate bowl. In another bowl, combine soy milk, vinegar, vanilla, and gel food coloring. Add applesauce to creamed sugar mixture and mix until incorporated. In halves, alternate incorporating dry ingredients and milk mixture on slow mixer setting. Repeat until all ingredients have been incorporated. Be careful to not over mix. Divide batter into pans and bake for 35-40 minutes* (about 18 minutes if cupcakes). Test cake for doneness with toothpick and remove from oven. Let cool in pan on a cooling rack for 15 minutes, then remove cakes from pan and cool completely on rack. In a stand mixer with paddle attachment, beat vegan cream cheese until light and creamy, about 5 minutes. Slowly incorporate confectioner's sugar, salt, vanilla extract, and melted coconut oil**. Beat until well mixed. To provide additional stiffness, optionally add all purpose flour and beat until well combined. The addition of starch will help with the frosting structure. Use immediately or cover with plastic wrap against surface until ready for use. If needed, trim the tops of each round cake to level any unwanted domes. 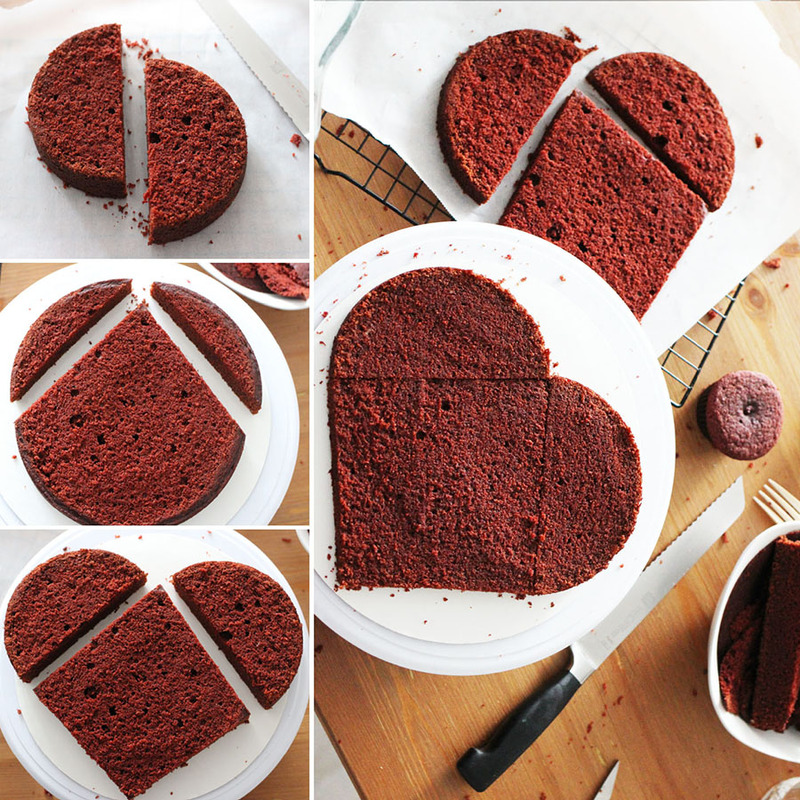 Cut cakes into required heart pieces (see pictures in accompanying post). Cut the 6" round cake in half to create two semi-circles. These will make up the adjacent rounded sides of the heart. Cut a 6" length straight edge into the 8" round cake. Repeat to cut a second 6" straight edge length with a shared point to the first. Place the two 6" semi-circle pieces against the two 6" lengths of the larger cake, with the straight edges of each cake touching. Complete the heart shape by cutting the final two straight edges of the heart with the point directly opposite the point created by the two rounded sides of the heart. The original 8" round cake should now look like a kite-like rectangle. Secure the heart-shaped cake to a cake board (I used a 10" round) by applying a small amount of frosting to the base. Cover the top of the cake with a layer of frosting and spread with a small offset spatula. Spread a thin layer of frosting along the sides of the cake to achieve a "naked cake" look. 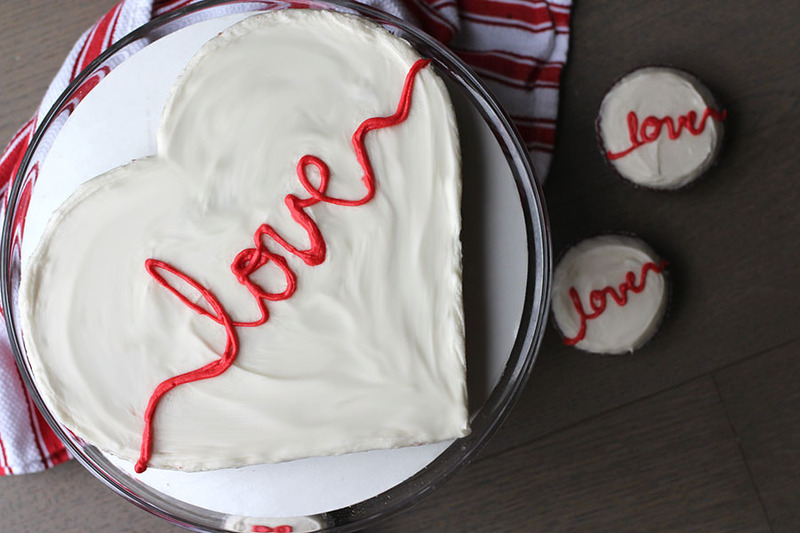 Optionally, add a small drop of red gel food coloring to some frosting and use to pipe designs or write "love" on top of the cake. 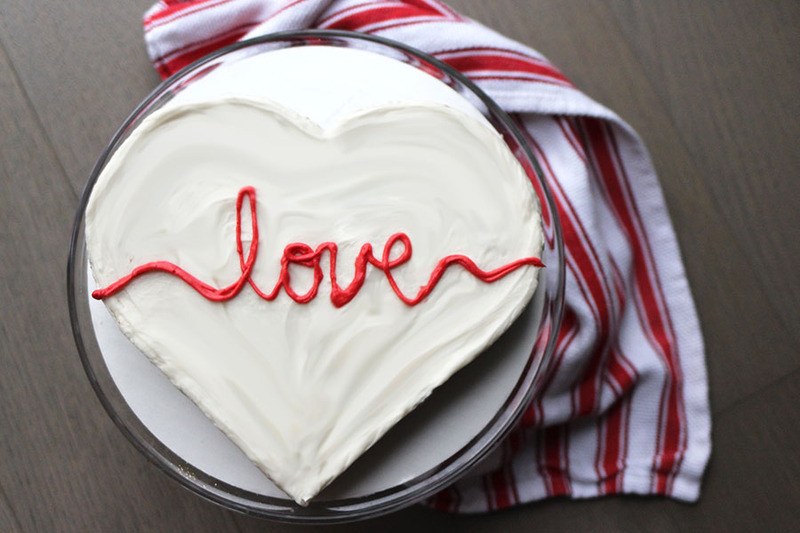 This recipe makes one heart cake (use 6" round + 8" round OR 6" square). Alternatively, this recipe makes 12-14 regular sized cupcakes. * Note that these are approximate cooking times and individual cakes may require more or less time depending on oven conditions. ** Coconut oil should be melted to ensure homogenous incorporation into the frosting and avoid coconut oil chunks. Find and follow me on instagram or bloglovin’ —it’s a great way to get a consolidated “smart feed” of all the blogs you know and love, and it’s also an outlet for finding new ones to enjoy!